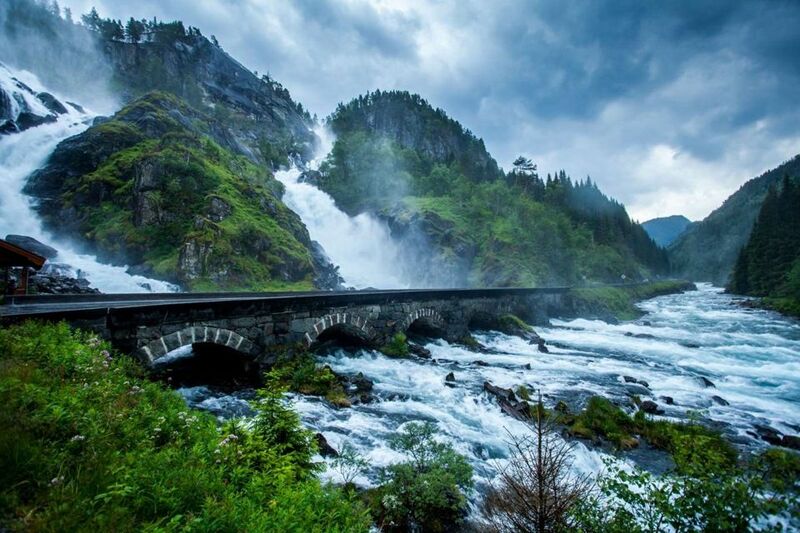 This stone, six-arched bridge was built over the Låtefossen or Låtefoss waterfall of Odda in Hordaland County, Norway. Whenever people drive over this bridge, they can have a great view of this 541 ft tall waterfall flowing down from the lake Lotevantnet. This concrete arch bridge was built over the Tara River in northern Montenegro between the villages of Budečevica and Trešnjica. 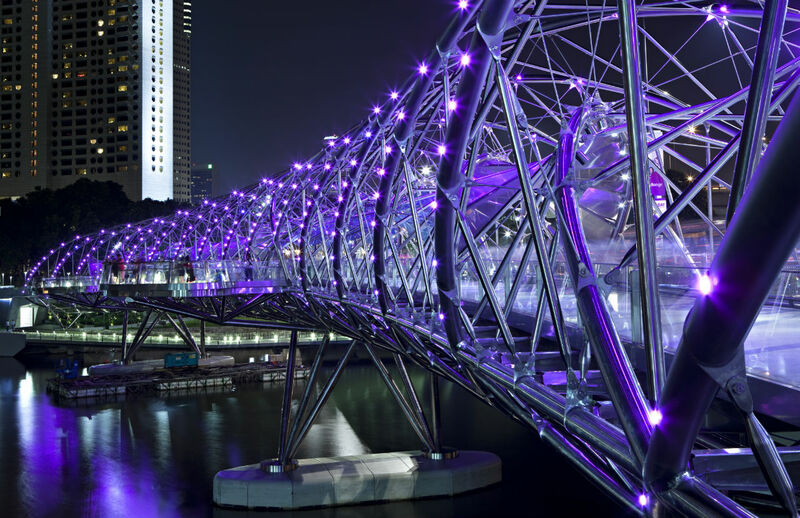 This bridge was called the Double Helix Bridge earlier, and later on, it has been changed to The Helix Bridge. It is a pedestrian bridge connecting Marina Center with Marina South. This deck arch bridge connects the Champs-Élysées quarter with those of the Invalides and Eiffel Tower. 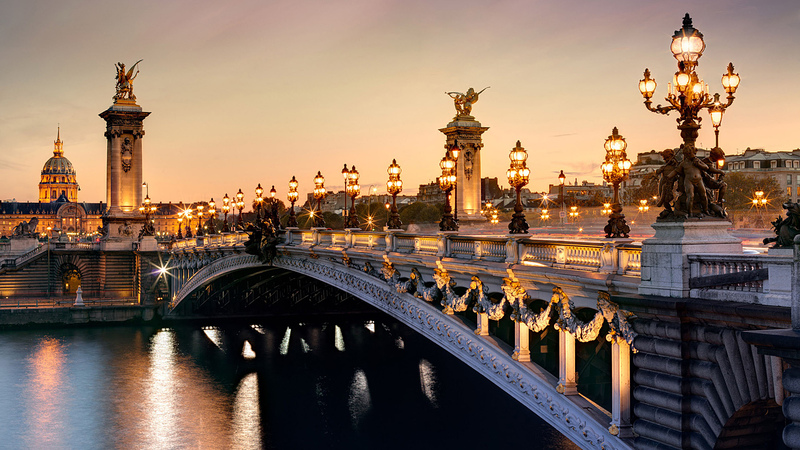 It is considered to be the most fancy and luxurious bridge in Paris. 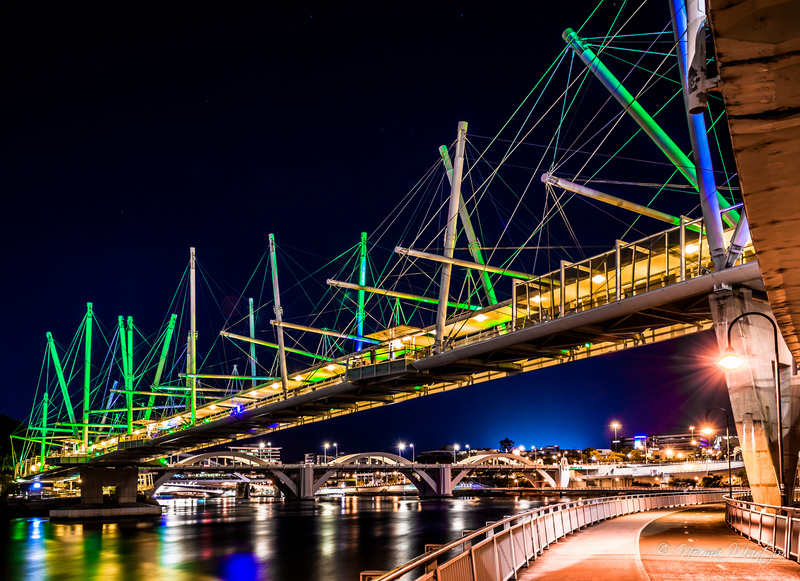 The Kurilpa Bridge is located over the Brisbane River in Brisbane, Queensland, Australia. It’s a A$63 million pedestrian and bicycle bridge. This bridge joins Kurilpa Point to Tank Street. The Siosepol Bridge was constructed over the Zayandeh River supporting a tea house which is deserted at the present time owing to the lack of water and river drought. This 297.76 meter (976.9ft) long bridge is highly ranked to be one of the most well-known examples of Safavid bridge design. 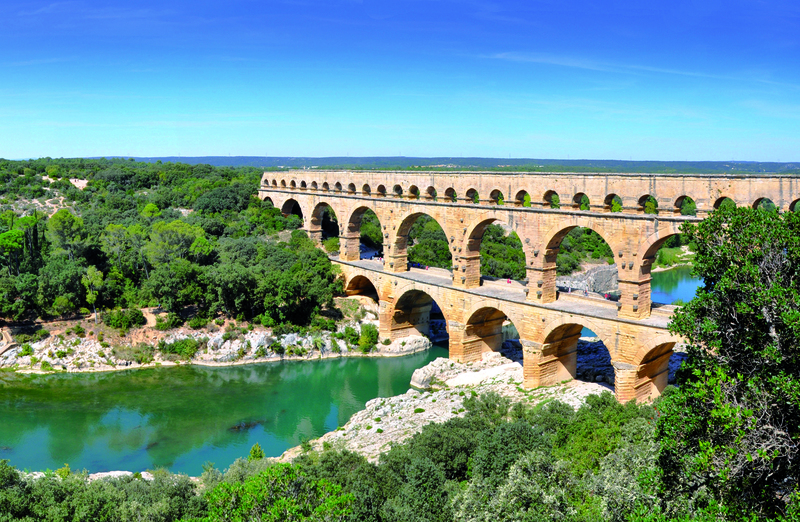 This ancient Roman aqueduct bridge is located near the town of Vers-Point-du-Gard crossing the Gardon River in the south of France. This bridge is 48.8 meter (160 ft) high with the capability of carrying an estimated 200,000 M3 of water per day to the fountains, baths and homes of the citizens of Nimes. Nowadays, it becomes one of the most popular sites in France among tourists. It is the highest pedestrian bridge in Singapore standing at 36 meters above the busy Henderson Road. This bridge links Mount Faber Park to Telok Blangah Hill Park. 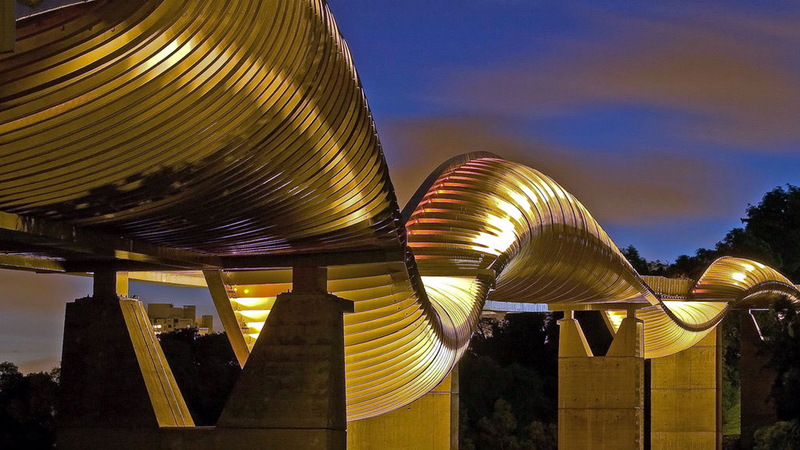 This bridge looks amazing and unique with its wave-like shape made up seven undulating curved steel ribs that alternatively go above and below its deck. Previously, this historical bridge, located in Chengyang, was called Chengyang Bridge, but it was renamed as Chengyang Wind-Rain Bridge in 2003. 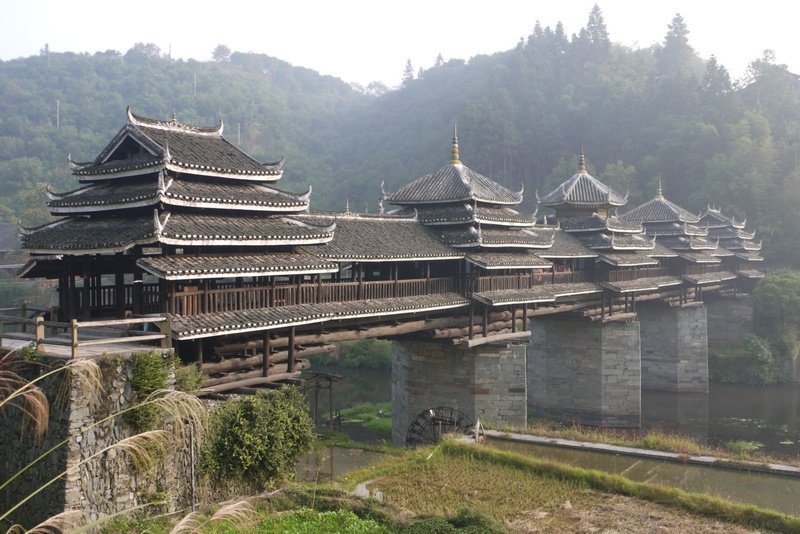 This bridge was constructed with a combination of bridge, corridor, veranda and Chinese pavilion, and it has a total length of 64.4 meters (211 ft). 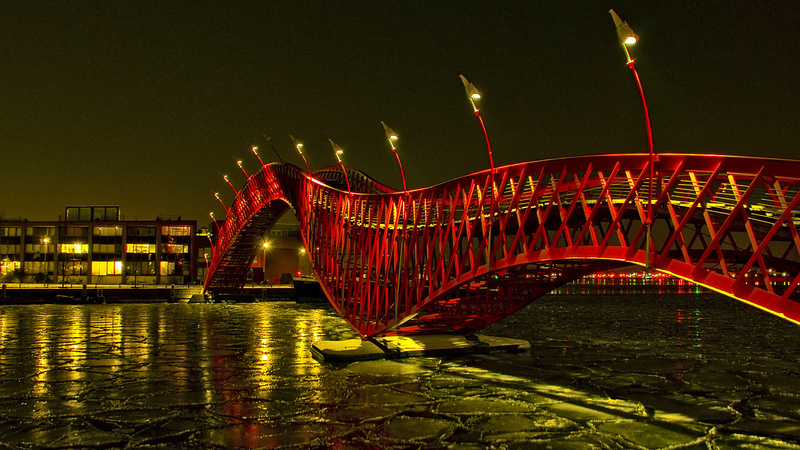 This beautiful bright red bridge was constructed in 2001, and it crosses the canal between Sporenburg and Borneo Island in Eastern Docklands, Amsterdam. 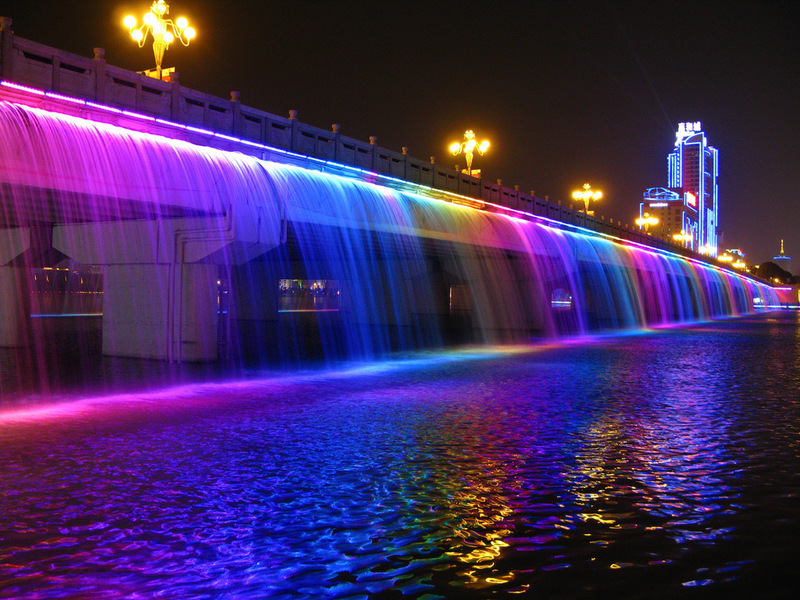 The Moonlight Rainbow Fountain Bridge is a main bridge in Seoul linking between Seocho and Yongsan districts. It has a total length of 1, 495 m (4,905 ft) and a width of 25 m (82 ft). This amazing bridge has been built with nearly 10,000 LED nozzles which run along both sides that is 1,140 shooting out 190 tons of water per minute. This bridge looks really stunning at night-time with the view of rainbow-like lights. This footbridge is located near the Historic Columbia River Highway, Multnomah County, Oregon. It is a 14 meter (45 ft) long footbridge spanning Multnomah Falls on a pedestrian trail leading from the Multnomah Falls Lodge to the top of the falls. Travelers can enjoy the beautiful view of the Columbia Gorge and Little Multnomah once they arrive at the top platform of the upper falls, which is not visible from the ground level. This stunning railway viaduct was built over a high cliff spanning the Landwasser River between Schmitten and Filisur, in the Canton of Graubünden, Switzerland. This bridge has the total length of 136 m (446 ft) and the height of 65 m (213 ft). The Lupu Bridge, one of the world’s longest steel arch bridges, was built over the Huangpu River in Shanghai, China. It joins the city’s Luwan and Pudong districts. The total length of this bridge is 750 m (2,461 ft). This bridge is a popular tourist attraction known as Shanghai Climb. 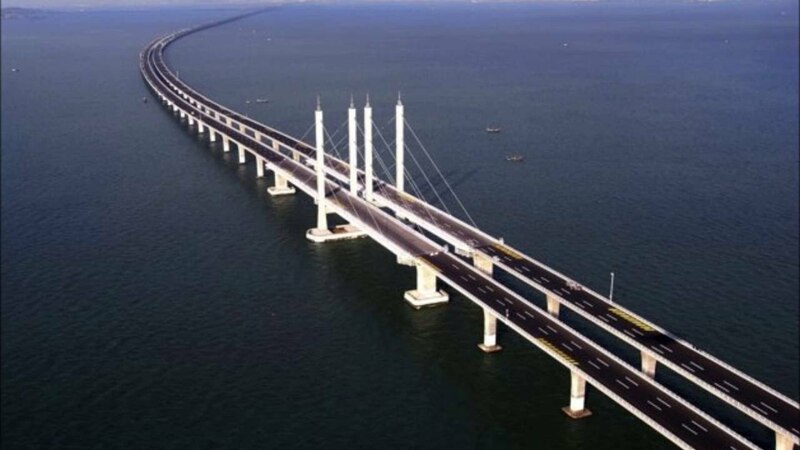 Hangzhou Bay Bridge is a 35.673 km (22 mi) long highway bridge connecting the municipalities of Jiaxing and Ningbo in Zhejiang province. The groups of engineers have spent a considerable period of time testing and evaluating this bridge before it was opened to public. 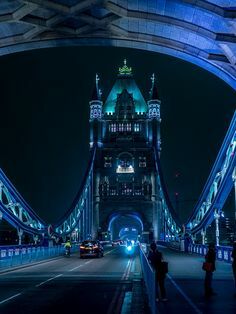 The Tower Bridge crossing the River Thames is a combined bascule and suspension bridge in London. It is considered to be the iconic symbol of London. This great church, El Santuario de las Lajas, is situated on a valley in southern Colombia. This fascinating building is linked by a bridge to the rest. According to legend, the Indian woman named Mary wore on the back her daughter Rose, when suddenly for the first time in her life she spoke and asked to go to the nearest cave. 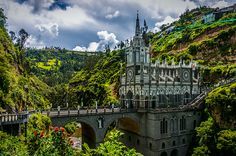 El Santuario de las Lajas is a neo-Gothic church (cathedral) which was built on the bridge spanning the river gorge between 1916-1944 in such a way that the gorge cliff with the image of the Virgin forms the back wall of the church. The church was built to commemorate the appearance of the Virgin which legend has it, her image appeared on an enormous vertical rock 45m above the river. As you walk down the hill you will notice the multitude of plaques along the cliff wall placed by pilgrims from Colombia and abroad as thanks for the miracles that have occurred and are accredited to the working of the Virgin.